C4, D4, or E4… that is the Question? I thought it was about time to get Shakespeare on the Hammer website. At club level chess, I am currently rated ECF 150 (roll on July) – you do wonder what is the best opening move. Taking the White side first. I am a confirmed e4 player as White – it feels more natural, I have more knowledge of the openings resulting from this move. I am in my comfort zone. This season, more than ever before, I am feeling the irresistible pull of d4 or c4. Indeed, I am experimenting more and more on chess.com in bullet chess. The problem is translating that experience into the over-the-board, long game and match scenario. One of the pearls of wisdom I can pass on to the more youthful members of the club from my 58 years in this mortal coil, is that the older you get, the more risk averse you become. To put it another way. Imagine me as a 25-year old – I was one once – and I had been a competent skier. If the choice was between a black run or a red run, the former would win every time! Thirty-two years later the choice is now between red and blue – with the latter winning most times. In other words, your desire to be reckless diminishes as surely as the march of time. So, will I make the change? Maybe, or maybe not! Next season is the crunch time. When an opponent flashes out c4 or d4 I immediately assume they are a more sophisticated player. They have read a bit! In my mind, they are prepared for a strategic and positional struggle. They know a thing or two! e4 feels more basic, more caveman than high-brow. The struggle will be more tactical and a positive result more likely. It feels like your opponent is shouting “charge!”. A fight to the death is taking place and you cannot avoid it. 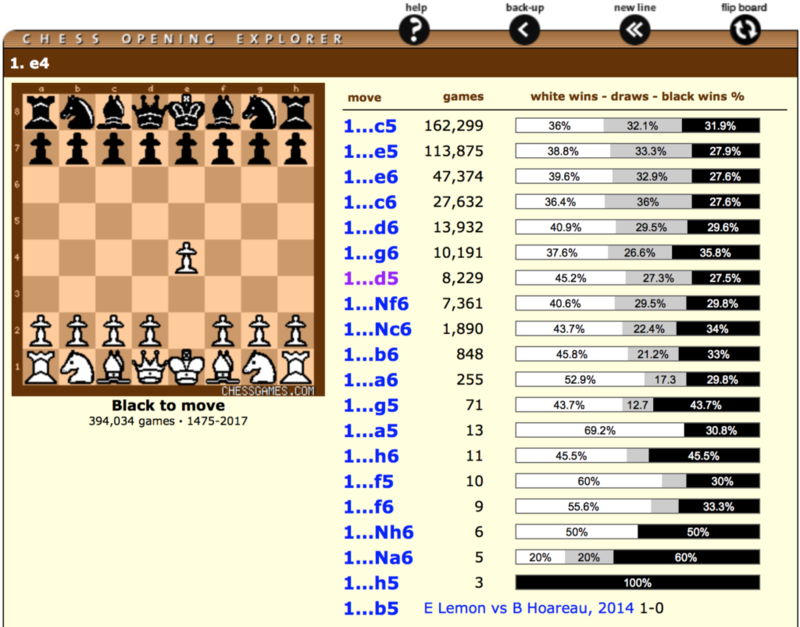 c4 or d4 feels like let’s see where we go, as I exert the advantage of first move. However, they will seek to slowly strangle you, and do so without risk to themselves. Bobby Fischer played e4 for practically his entire chess career, until embarking on his WCC match against Spassky. I know there were two c4 games in the interzonal in that cycle, but his real switch came when the title was on the line. Poor Spassky must have been totally bemused as it appeared he had no preparation to go on, and coupled with his laid-back character, no defence. In a recent article for the website I referred to the use of psychology in chess. The result in a game of chess, like all other sport, is often dictated by mental strength. If you can, legally and fairly, get inside the head of your opponent and use that properly, you are well on your way to victory. Fischer’s use of c4 made hours of analysis and preparation completely redundant. A massive psychological blow. To sum up – and remember this is just my view! – all three moves are good, and maybe wisdom and experience comes in to the equation. I have been a confirmed e4 man all my life but am starting to feel the irresistible pull of a Queen-sized offering. Am I being pragmatic, or just getting old? You decide!! If you’d like to write an article for the website, please get in touch. All contributions welcomed! Don’t forget, the next evening of training & learning takes place this coming Monday at the Albion, starting about 7.30pm. Our top-rated player, Carsten Pedersen, will be running through a couple of games to give us his thoughts & insights. Come join us! I know what you mean about 1. d4 The Q pawn players always seem to hold the first move advantage longer. Don’t get carried away with stats however. Some guy on Chess.com did analysis using a minimum per move of 100 ‘master only’ games. His conclusion, if I remember correctly, was that Nf3 is best. 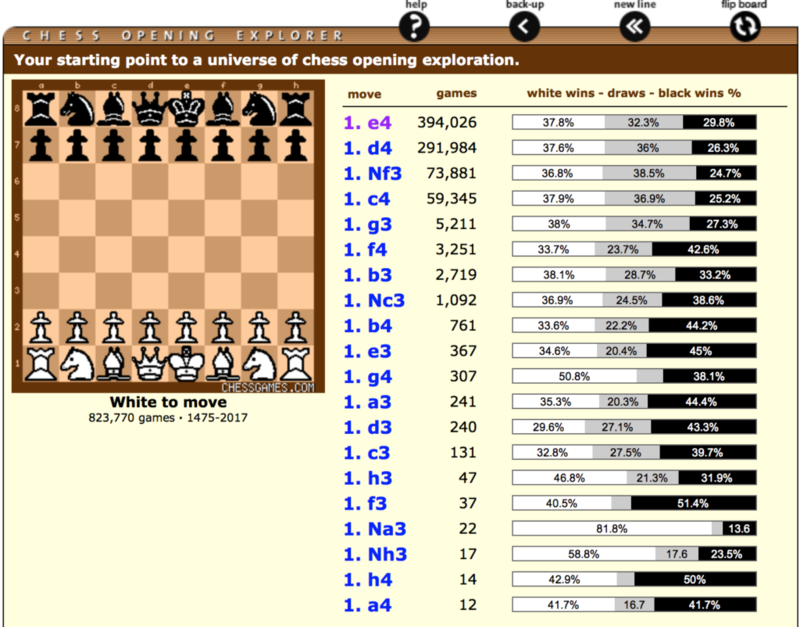 The books all say that the moves d4, c4, g3, Nf3 are almost interchangeable. I know Fischer purportedly said e4 is ‘best by test’, but I saw an interview a while back with Spassky where he said both he and Fischer agreed that d4 is the best opening move. The reason he gave was that the pawn is protected. As an aside, I remember back before most of you were born that Michael Basman said White can play, e4, Nf3, g3, Bg2, d3, Nc3, 0-0 against almost anything black plays and he will get a decent game. Basman beat Karpov when he was world champ, so listen to MB and try it. Personally, I like e4 because it permits early castling. Excellent stuff had no knowledge of the Spassky /Fischer accord on d4. I can believe it..I think Spassky and Tal were the only Russians Fischer actually liked and respected.